Doesn't tell you anything you need to know. He should be fired from writing books. Trump in entertaining, and he is trying to teach you how to "think like a billionaire". But this is the only true value of the book. His direct advice is useless, but if you listen to his logic and reasoning on all of his decisions, then you can take lessons from how to think efficiently. I like Trump's books. Down to earth, strong style that helps keep motivation high for pursuing financial goals. I like Donald and like him in interviews and TV shows. But this book is boring. He just talks about the people you should hire to get the job done: real estate agent, interior designer, the right contractor, etc. I believe he uses "great" at least a thousand times in his book. In the second half of the book he talks about the new episode of "The Apprentice", and the boredom goes on. Too bad, I would have liked to learn something from this great business man. Decent read/listen ... and I really like Mr Trump - he's an American worthy of our study. However, I'm not sure what he was going for here - the content is mismatched against the title. "Think Like Me" would have been a more accurate title ... I didn't think it was much of a "wealth building" coaching book for the average professional. Many of his so-called recommendations are just impractical for anyone who does not already have financial independence (or close to it), and a few of his statements were so "over the top", I couldn't be sure if he was going for a laugh or being serious. For example, paraphrasing here, Mr Trump said of taking a vacation, "If you really love doing your job more than anything else, why bother? Who needs a vacation? " Really??! 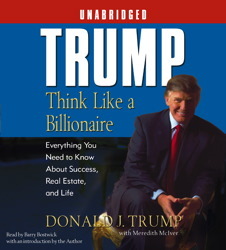 This book was simply entertaining and does not give you insight to think like a billionaire, it gives information as to Donald Trump's social life, the Apprentice and what Donald 's likes/dislikes are about how to think like a billionaire. Alittle disappointed but was good entertainment. The Donald on interior decorating, landscaping, fashion, etc.? You've got to be kidding! A truly painful listening experience. Halfway through the 2nd disk, my cd player refused to play any more of it! Don't waste your time. I don't know why this had only a 2 star rating, but the audiobook is a lot better than that. In this book, Trump is his usual self....T R U M P! Having an entrepreneurial spirit myself, I respect the man. He's using his marketability to the full extent. Although some of the information in the book doesn't seem quite "real," it's very entertaining. Reading between the lines, you can start to see some of the complex workings going on inside "The Donald." How does he do it? It's so much? Well, he's a master at it. It takes time, and persistence to reach the heights that he has....(no wonder why he can get up to 250K+ per appearance!). The best part of the book probably comes from his journaling of "a week in the life." It helps in instilling confidence in the reader to make decisions and move on to other things. In otherwords...Get it done. Excellent for those liking money. Not much substance in this book. Interesting if you want to hear Trump brag about himself, Name Drop about his Celeberity and Talk about how great "The Apprentice" show is. I am a Trump fan, but was disappointed with the total fluff and lack of anything useful out of this book. Sorry, Trump, but as far as an author, you should be fired.